Relax! 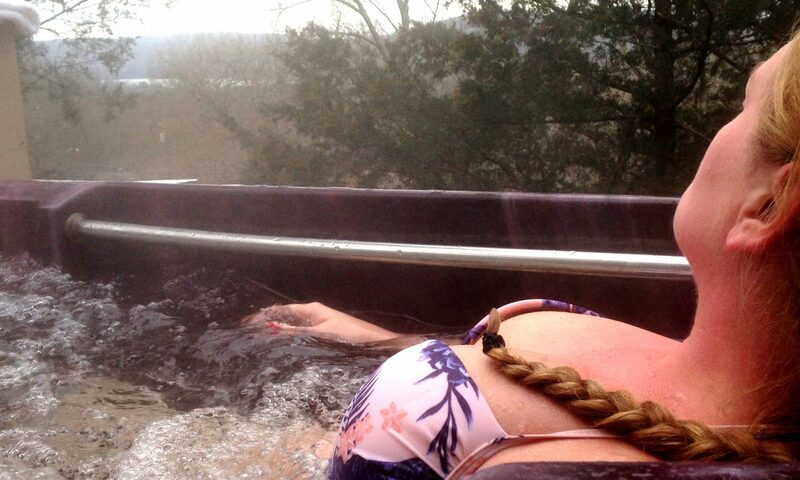 You can actually gaze up and see the stars while enjoying the private Hot Tub when you holiday in the Tiny Cabin Tenkiller at Cedar View. 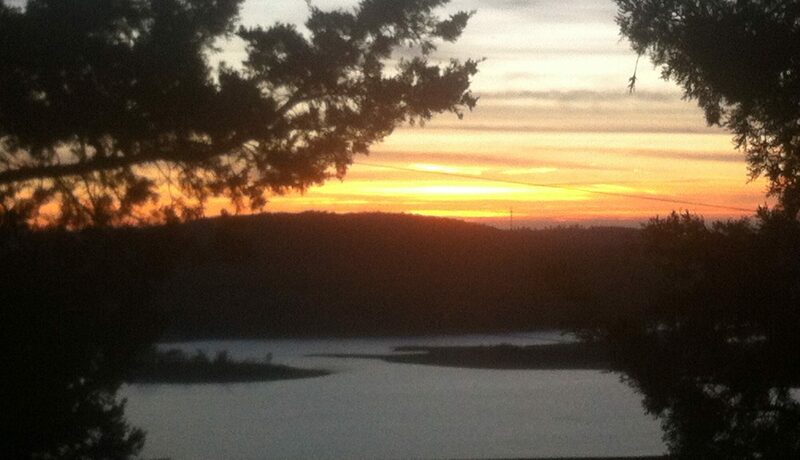 If you are a couple escaping the grind, family on holiday, hunting trip, or a group of friends enjoying the lake and river you will find Tiny Cabin at Cedar View overlooking Pettit Bay, Lake Tenkiller, Oklahoma a unique bargain. Tiny Cabin Tenkiller is a tiny French Gîte trimmed out in western red cedar. Nestled part way up Pettit Ridge just off Pettit Bay Road on the quiet private Grand View Lane. 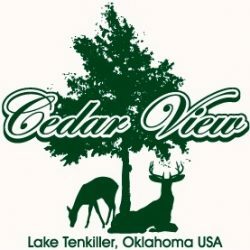 Cedar View gives you beautiful lake view sunsets yet is very close to the entrance of Pettit Bay Landing, a quick trip to Tahlequah, the scenic Illinois River, Cherokee Ancient Village & Museum, and capital of the Cherokee Nation. Tiny Cabin Tenkiller sleeps 2-3 comfortably with a King loft bed & sofa bed fitted with fresh lenins. The vaulted ceiling and efficient open design gives guest the feeling of space. Designed for quick holiday the cabin is fitted with an under-counter frig, microwave, crock-pot, charcoal grill, sink, and utensils. The no-fuss wood floors are sealed in polyurethane for simple clean up of anything that might get spilled. With Cedar View’s on-site laundry facility there is no need of spending valuable holiday time searching for a place to wash clothes. After a busy day of fun kick back and recuperate while watching TV or surf Wifi while relaxing on the deck if you are unable to escape logging in. Then enjoy s’mores while gathered around the fire pit. Cedar View property sitting on the hillside of Pettit Ridge has four distinct terraces. The lowest fourth terrace is raw hill side with a buffering of trees and dense tree growth to the south and north of the property giving you a private secluded fell. The Tiny Cabin cabin is located on the north end of the third terrace with parking next to cabin. Next door you will find the Swedish Sauna always ready to sweat your stress & pain away! With the on-site laundry facility so there is no need of spending valuable holiday time searching for a place to wash and dry clothes during extended stays. Although we have had 30ft boats on the property boat parking is tight so unless you are an experienced trailer backer it is best to take advantage of one of our two reserved slips Pettit Bay Marina at $30 per day. No boat but want to boat? No Problem! We have the USS Yatch-Not paddleboat available for $30 per day. Pre-approved Pets are welcome with a $30 fee. After a busy day of fun, kick back and enjoy s’mores while gathered around the fire pit. When it’s time to head back to the grind we make it easy on you. Other than dishes & taking out the trash don’t worry about doing up the cabin. Simply leave the beds undone and toss the used towels in shower floor as we’ll take care of getting it ready for the next guest. We want you to head home relaxed.